The majority found the Vivobarefoot Primus Lite to be a highly comfortable shoe. Most of the users highly appreciated the very light weight of the footwear. Several customers highlighted that the shoe had a reliable capacity to adapt to the natural shape and movement of the foot. A few runners welcomed the minimalist, closer-to-ground feel by saying that it was like ‘feeling the natural ground but with protection’. Some purchasers said that they liked the overall look of the shoe. A few users mentioned that they loved the colors the footwear was available in. A wearer said that the shoes were comfortable ‘even without socks’. A runner said that it took him time to get used to the shoe. Everyone loves the idea of becoming a barefoot runner much like the 1960 Olympic gold-medalist Abebe Bikila; however, over time our feet have become softer due to the padding and support shoes have become. The Vivobarefoot Primus Lite, much like the Vivobarefoot Stealth II, is a solid barefoot running shoe that provides breathability, comfort, and the same PRO5 puncture resistant outsole. Now be warned, hyper-realistic barefoot running shoes need to be slowly introduced to your feet if you plan on becoming an avid barefoot runner. If not, the benefits of barefoot running will be thrown out and injuries will most likely pop up. In order for everyone to be happy and safe at the same time, the outsole needs to have that perfect combination of multiple things. The outsole needs to be thin enough to avoid feeling bogged down from the shoe and trapping so much heat it feels like a furnace in the shoe. Also, the outsole needs to have the feeling of being barefoot but safe enough where it is resistant to nuances, like broken glass, or other debris, that would make actually being barefoot horrid. Vivobarefoot has taken into consideration all of these concerns and perfected it to make what they call the PRO5 outsole. However, the PRO5 cushion just takes care of the basics. Just like the sister shoe, the Vivobarefoot Stealth II, the outsole does not have enough traction to handle wet conditions at all. Be prepared to slide/slip if you decide to take a leisurely stroll during any wet conditions. With only 3mm of cushioning between your feet and the surface you are running on, you are bound to feel any divot, rock, or any odd surface. With outsole protecting all of the sharp pain that you might have while running, you will still feel an uncomfortable pressure on your feet that will still make you sore (at least from my experience). For those who already are acclimated to barefoot-feel running, then this feeling will be typical and should not be taken into account when considering on getting these. 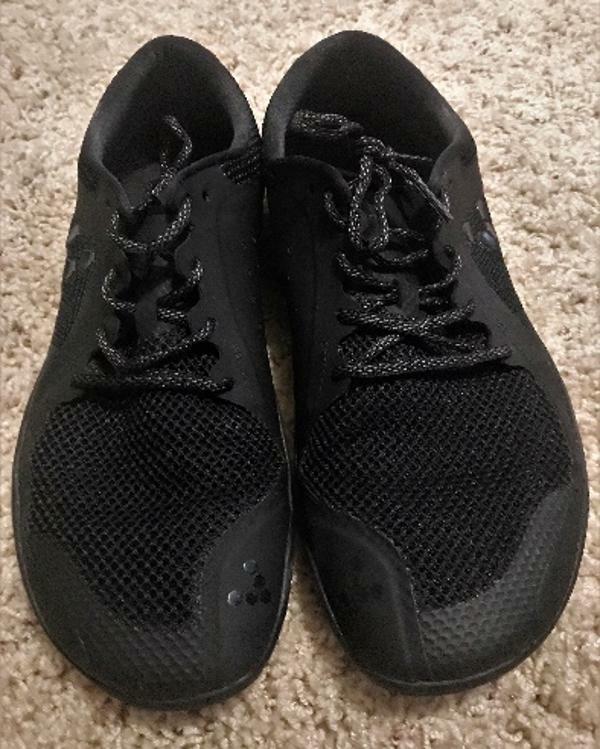 However, those who are new, this shoe does not come with an insole which helped me get used to the Stealth II because it provided some cushion. The upper is one of the most comfortable, breathable running shoes that I have ever ran in. Unlike the Vivobarefoot Stealth II where there were issues with the mesh and bleeding when it gets wet, the Primus Lite excels on not bleeding and providing excellent air flow. There are two components that are in the upper: the mesh, and the very thin fabric. The mesh provides air flow and makes the shoe comfortable, the fabric provides protection and structure to the shoe. There are areas where there is just the thin fabric, like the medial areas, and makes those specific areas uncomfortable and a bit hot. However, there are pockets of just mesh which makes the fabric less hot and uncomfortable. The upper consists of two main components: the mesh and thin fabric which makes the upper one of the most breathable and comfortable to run in. The Vivobarefoot Primus Lite excels at differentiating very similar shoes, the Vivobarefoot Stealth II. This shoe provides confidence to any barefoot runner by integrating their signature PRO5 outsole and combining it with off-the-charts mesh/fabric upper. In the rain, this shoe underperforms because of its lack of traction. The interesting aspect of the Vivobarefoot Primus Lite is that the shoe delivers a level of quality and performance on the roads using only a minimum amount of technologies. The exterior side of the lightweight TPU provides the needed traction on wet or steep surfaces, while its interior serves as the midsole. Also, the very thin yet sturdy upper assumes the shape of the foot which makes possible for the wearer to follow his natural gait while running without having to compromise on the comfort or the breathability. The neutral road running shoe is based on a minimalist design which, owing to its semi-curved shape, adjusts to the natural shape of the runner’s foot. The Vivobarefoot Primus Lite has a standard running length and a standard medium width of D for men and B for women, respectively. The Thermoplastic Polyurethane (TPU) outsole is light in weight, resistant to abrasion and has excellent traction. It ensures maximum protection underfoot and at the same time lets the user feel the natural ground underneath. Unlike a traditional midsole, this Vivobarefoot running shoe utilizes the inner side of the Thermoplastic Polyurethane (TPU) as its underfoot platform. It Is thin and flexible, qualities that are actually important for those who like to experience a near-barefoot performance. The upper unit of the Vivobarefoot Primus Lite utilizes a Breathable Mesh in order to maintain a well-ventilated in-shoe feel for the wearer. The open construction of this material allows environmental air to pass through it, enabling maximum ventilation inside the footwear. At the same time, it wraps itself around the user’s foot, offering a snug and secure fit. The Fused Upper Material, based on the minimalist design, feels seamless against the skin. Also, the material adapts itself to the shape of the foot, thereby enabling a natural gait for the runner. Thin overlays are fused to the main fabric. They provide structure to the façade of the shoe. They also help in maintaining a snug and secure wrap. Round laces cause the upper to provide a customizable coverage. They’re directly linked to the printed overlays via eyelets, thus making it easy to attain a fit that’s adherent to the preference of the wearer.